The Zika virus was already present and known to the world (mostly in Southeast Asia) before the current outbreak. Why has the virus caused such an extreme outbreak? Has it mutated from its ancestral form such as that found in Southeast Asia? There is one main answer to this question: The Zika virus spreads so fast because it never emerged in this part of the world. Hence there is no natural immunity available in the population and a lot of infections occur. Once this "first wave" of infections is over, the level within the population will fall drastically. Some more information on this topic can be found here. The Surinam strains are the ones published in the paper mentioned above and are from South America. I haven't (yet) found any other analysis, but this will only be a matter of time. At the moment we cannot make a final statement on this although there is some speculation around. Edit 23/02/2016: There is still no final conclusion available, but there is an interesting paper available on the Biorxiv-Preprintserver, which analyses the mutation rate in the genomes of the publically available strains. It can be found in reference 2. 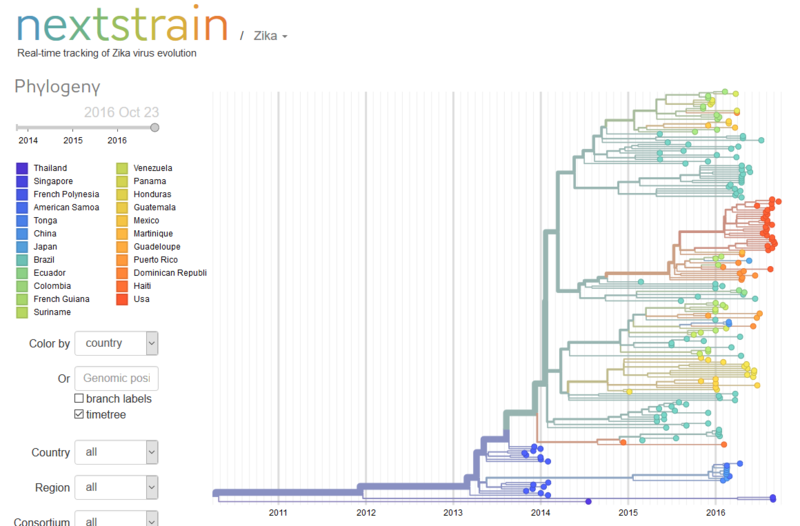 Based on the available genomes, the author calculates the mutation rate of the Zika virus to about 10 Mutations/year. The virus is a RNA virus which have generally higher mutation rates than DNA viruses. Especially named is the M2634V mutation, but since this is in one of the envelope proteins, the author finds it relatively unlikely (although not completely), that this causes a much higher mutation rate. The sudden spread of Zika to South and Central America does not appear to have been due any particular change in the mosquito vector or anything to make the Zika virus itself more virulent. But rather from the fact that infected people are now able to fly rapidly from country to country, thereby spreading the disease extremely easily. This means there is little to stop the epidemic continuing to spread to further areas of population which have little, if any, herd immunity against the virus. ZIKA - How Fast Does This Virus Mutate ? 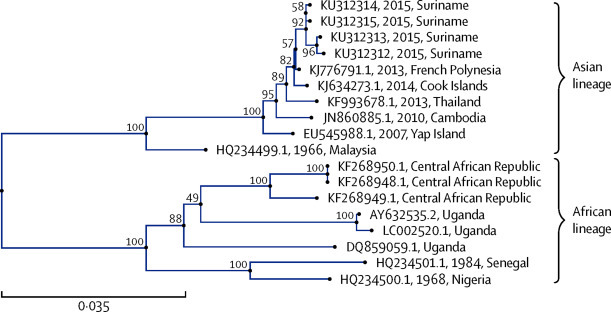 A mutation isn't necessary to explain the outbreak in the Americas, given the low immunity of the population, but there is tentative evidence that this strain of the Asian lineage of the virus may have developed some novel characteristics, which appear likely to have first emerged in the South Pacific. What is worrying is that we don’t know what may have changed, and why. There need to be genetic studies to understand the origin of this virus. There is no need to speculate, the complete genome sequence of an isolate from the Americas has been published and can be compared to earlier isolates. 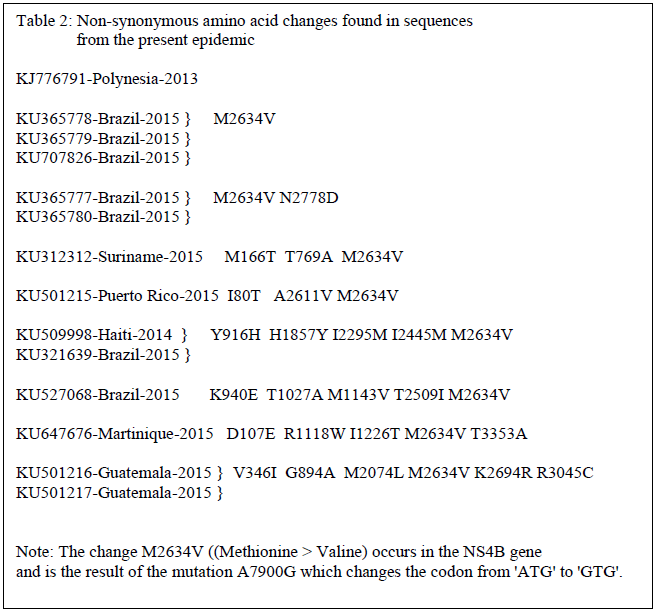 These data show that the genome is very close to the sequence of the virus isolated from French Polynesia.